(CN) – Size matters, but bigger isn’t necessarily better when it comes to brains, a new study sponsored by the National Institutes of Health reports. 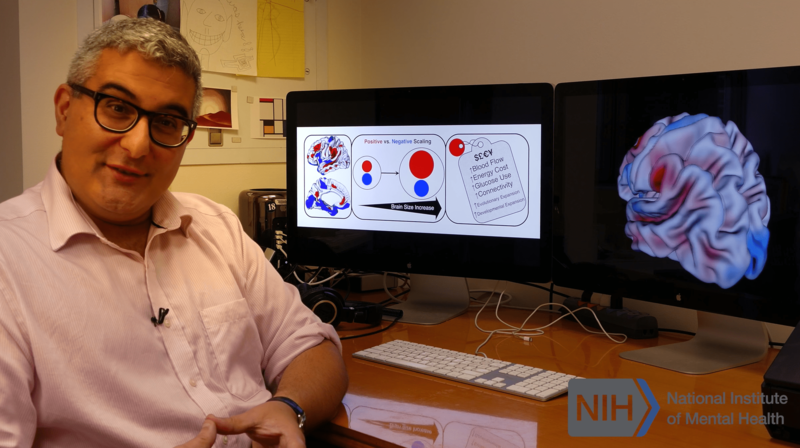 In this image taken from video, Armin Raznahan discusses new research funded by the National Institutes of Health about brain size. After gathering brain-scan data from more than 3,000 people, the researchers found that, the bigger the brain, the more its additional area is accounted for by growth in thinking areas of the cortex. This growth comes at the expense of relatively slower growth in the emotional, sensory and motor areas. “One metaphor is, if you think about making a garden shed as big as the White House, you can’t build it the same way, it has to be differently proportioned to stand up,” researcher Armin Raznahan said in a video touting the study, which appeared Thursday in the journal Science. A principal investigator with the Intramural Research Program at the National Institute of Mental Health, Raznahan collaborated on the study with P.K. Reardon, Jakob Seidlitz and colleagues from more than six research centers, including the Douglas Mental Health University Institute in Verdun, Quebec, the University of Pennsylvania and Yale University. The study found that cortex areas showing more expansion in larger brains sit at the top of a network hierarchy and are good at integrating information from lower order systems. Raznahan suggested that, since people with certain mental disorders show alterations in brain size, the new cortex maps may improve understanding of altered brain organization in disorders. The new information may help them better understand how genetic and environmental changes can impact higher mental functions.